Welcome, it's close to the middle of the year yet some children still struggle with drop offs in the morning. This week some ideas to lessen the tears and also how to foster a love of gardening in your child. Ask any child care worker and there will always be at least one child in every class who struggles with school or daycare drop-off. And though it is natural for a young child to feel anxious when you say goodbye, continued distress at separation, or separation anxiety, can be incredibly upsetting for all concerned. Separation anxiety can start before a child's first birthday and can last into the early school years, and the timing and intensity can vary and change, depending on the child. Often, in time, and with plenty of patience, the anxiety will dissipate. But there are several things you can do to make those morning meltdowns a little easier for everyone. In today's busy world and high-rise living, gardening is an increasingly rare hobby: we don't have the time, the space, or often the knowledge. However, the garden is a fabulous place for kids to learn many things – developing a respect for nature, an understanding of where food comes from, and the chance to experience many of life's lessons. 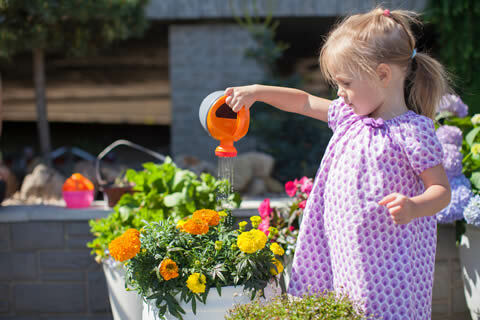 Gardening can teach patience, responsibility, and the benefits of working together, as kids learn about nurturing life and the process of growth. Encouraging kids to head into the garden isn't as hard as you might think, and you don't need a large space to do it! A planter on a balcony, a small patch by the front door or taking part in a local community garden is enough to get started. If space is really tight, cress and sprouts can be grown indoors in small plastic tumblers, or even old eggshells.